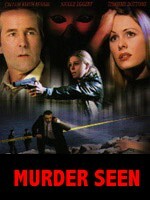 Murder Seen is a suspense thriller about a psychic co-ed tormented by the chilling details of a mysterious kidnapping on her college campus. Zoey Drayden, an intelligent and beautiful university student, receives a life-altering phone call from a distressed woman pleading for help. The eerie call evokes haunting dreams of the woman’s abduction. Driven to investigate, she discovers the disturbing reality behind her visions and decides to go to the police. There, Zoey meets Detectives Keegan and Stepnoski, and reveals details of the missing student’s case that only the police and the killer would know. To her disbelief, Zoey becomes their prime suspect and is arrested for masterminding the kidnapping. Determined to save the woman and free herself from the horrifying images, Zoey helps to capture a vicious serial killer, and in doing so, almost pays the price with her own life.